Cornwall is a magical place to get married. Fowey Hall can be your exclusive country house, where your day is exactly how you dreamt it would be. We provide a venue that’s totally flexible, with the utmost privacy for a unique wedding that reflects your personality – it’s all about you and your guests. We have 36 individually styled rooms, a spa with pool and outdoor hot tub, extensive grounds with beautiful views over the Fowey estuary, an Ofsted-registered crèche, an older children’s games room stocked with toys, and much more. We have a number of rooms licensed for ceremonies to take place at Fowey Hall. From the glorious Drawing Room for 50 guests to the impressive Garden Room for 120 guests, we have the perfect setting to suit your guest list. We take a personal and bespoke approach to organising your big day, from Pimm’s on the croquet lawn to sparklers on the veranda. With four beautifully styled treatment rooms and a wide selection of treatments, our spa is the ideal retreat for some all-important me time. The Four Bears' Den is the hotel’s Ofsted-registered crèche. Children can come along and play with all the toys and take part in fun-filled activities such as arts and crafts, face painting and much more! Older children can meet friends in the Blue Room, or watch the latest movies in the Cinema Room. Babysitters are also available, often our own nannies. Please note that there is an additional charge for this service. Cornwall has an abundance of fantastic ingredients all year round, and our Head Chef has a wealth of knowledge when it comes to catering for weddings. Our Chef will meet with you and customise menus to suit your style and taste, leaving you and your guests to simply relax and unwind over quality, locally sourced and seasonal produce cooked to perfection. Throw an exclusive country house wedding at Fowey Hall Hotel. Offering a unique venue for a luxury hotel wedding, here you can enjoy absolute privacy, stunning surroundings and a bespoke celebration. As well as first class cuisine, beautiful surroundings and 36 individually-styled rooms in which to accommodate your guests, we also have a spa with pool and outdoor hot tub, an Ofsted registered crèche, a cinema room and an older children’s games room stocked with the latest DVDs and video games. 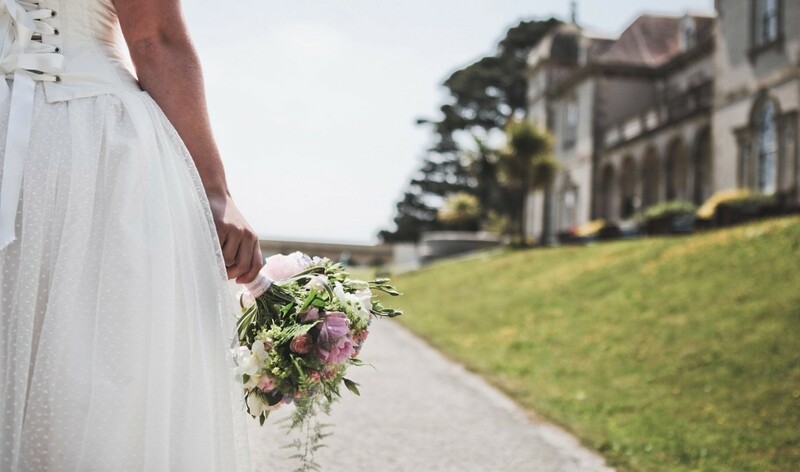 Please contact our Events Manager on 01726 833 866, or email weddings@foweyhallhotel.co.uk for more information or to start planning your big day. Fowey Hall was built as a beautiful Victorian mansion by local resident Charles Hanson.